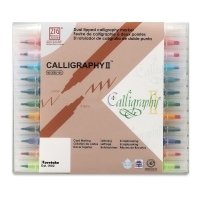 From creating journals and designing borders to creative lettering and doodling, markers are an integral part of the art of calligraphy. 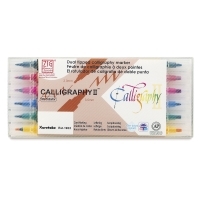 Zig Memory System Twin Tip Calligraphy Markers are designed specifically for use in scrapbooks, memory books, photo albums, journals, and diaries — and for creating wedding invitations, stationery, certificates, greeting cards, and crafts. 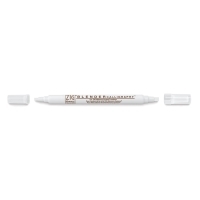 Every Zig Memory System Calligraphy Pen possesses two tips — one broad tip to title your pages and make simple borders, and one narrow tip for delicate lettering and scrollwork. Each double-ended pen contains pure pigment ink that stands the test of time, so your precious memories can be preserved for future generations. The ink is photo-safe, acid-free, lightfast, fadeproof, non-bleeding, odorless, xylene free, and smear-proof (when dry).